Finally received my TNC-01 Ryu statue set!! Ever since I saw teaser pics of this new line on the BigBoysToysHK Facebook page, I knew I had to have it, and it was definitely worth the wait! To get one for yourself (with my highest recommendation!) click the link below to head on over to Big Bad Toy Store! But onto the statue set itself! The packaging is quite nicely done, and I love the artwork. The comic, semi-deformed art style just works with Street Fighter characters! 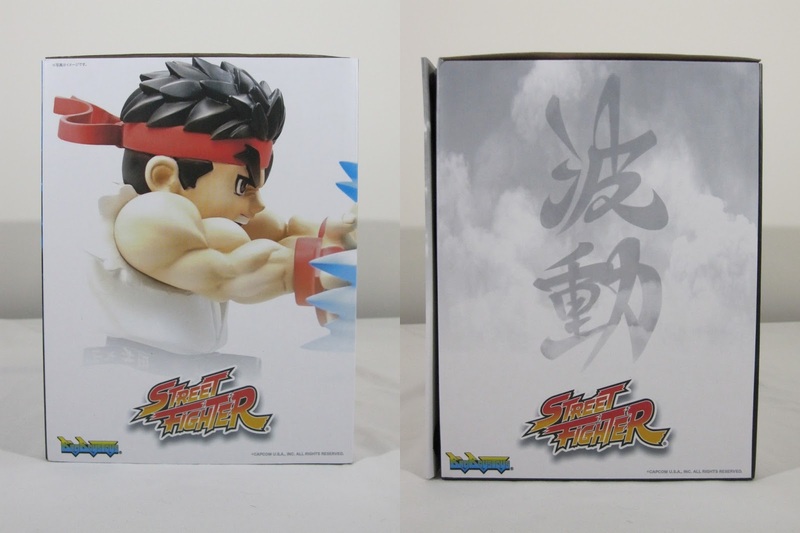 I like how the front fold-away lid has the face of Ryu, and then the inside of the flap has the rear view in silhouette. Great box design overall! The rear gives the usual photos of the item inside, and all colourfully done. This was the first I noticed that it actually included a collector card, which was a nice extra touch. The sides are pretty simple with a closeup on one side and Chinese characters on the other. And I really like how the box folds open to review a visible space to view the statue if you want to store it in the box. Not a bad feature if you're short on space. The top is rounded off with Ryu's name in the old Street Fighter styled font. So all in all, really nicely packaged for collectors. The statue itself is just AMAZING!!! If you're a Street Fighter fan, especially one that played Street Fighter 2 in the arcades, you are going to love this as much as I do! 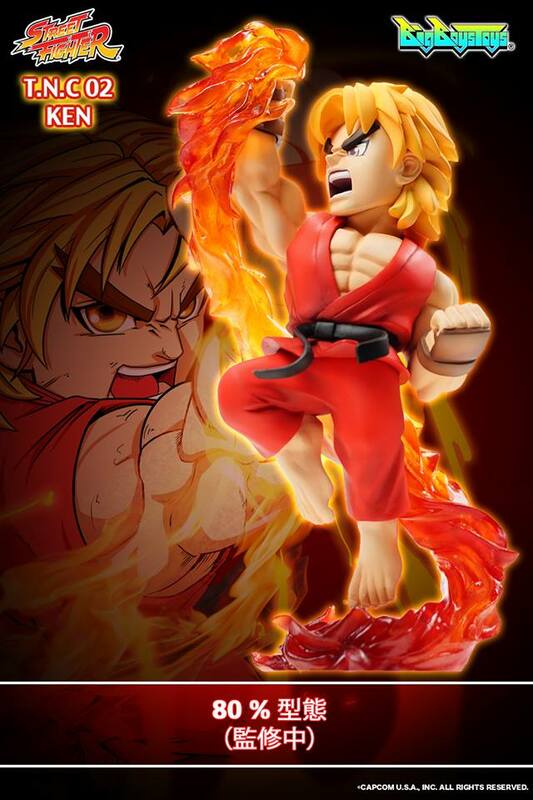 The head sculpt is just perfect with that angry fireball face, and the stance is pure iconic Hadoken style from the original Street Fighter 2 game. The lighting effect is cleverly done, and I still haven't figured out how they get the electronics in to the fireball to light it up. But either way, placing him on the base and pushing the button at the front will make all Street Fighter fans smile. The Hadoken sound effect is quite loud, and the light effect automatically dims after a second or two. With the high gloss background and base, the whole set just captures that iconic Street Fighter 2 stage perfectly! They've already teased the next statue in the line with TNC-02 Ken, and that looks every bit as awesome as this Ryu. If they can continue with this level of quality, BigBoysToys will have a fantastic line of Street Fighter statues that will be sought after by fans for years to come! Highly recommended! I'm a huge Star Wars fan, and I think 2015 and early 2016 will be a great time for 1/6th scale fans. 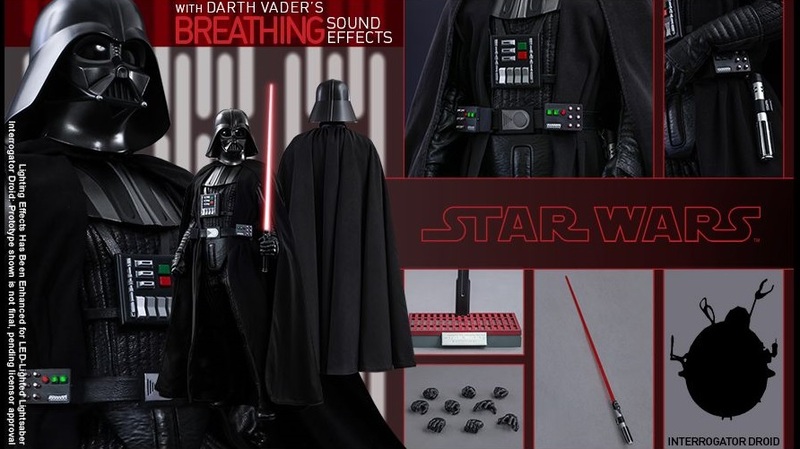 Ever since I started collecting this larger scale, I've always wanted the core cast of the original Star Wars movie, and Hot Toys is now finally going to deliver! And they all look pretty spectacular! The Shadow Trooper was released not long after the Stormtrooper two-pack, and I was definitely glad to be able to get my hands on one. It's a fantastic figure! Again, the glossy finish adds a really nice premium feel to it, and the subtle weathering is nice too. It's sold out now, so your chances are limited I think unless you pay crazy prices in the aftermarket. The next set to be released will be Han and Chewbacca, which can be ordered separately or as a combined two-pack. As with the Stormtrooper set, the two-pack is definitely the way to go since it gives additional accessories not provided if you order them separately. 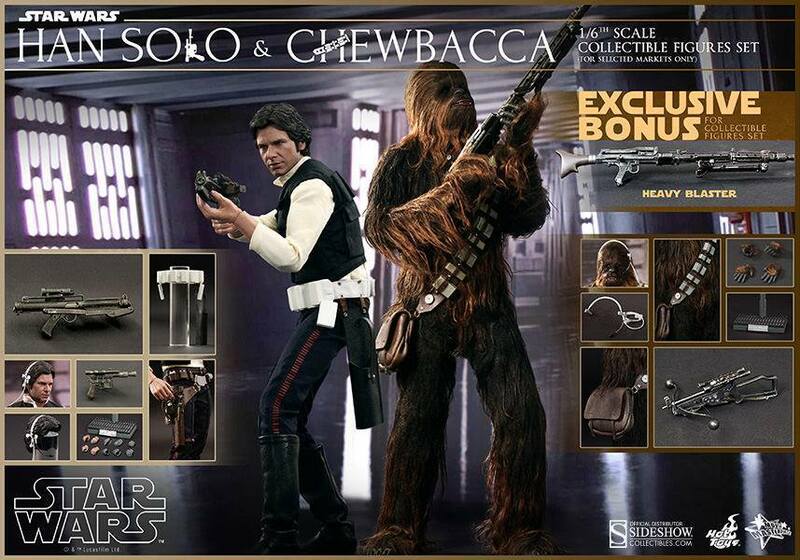 With Chewie being a full synthetic fur body, I reckon it will be the figure of the year! If they tweak the Han sculpt to look more like him, it'll be the perfect start to the core hero cast! Next up is then Darth Vader, which is different to the Sideshow Deluxe figure in that it's the Ep4 costume not the Return of the Jedi costume. 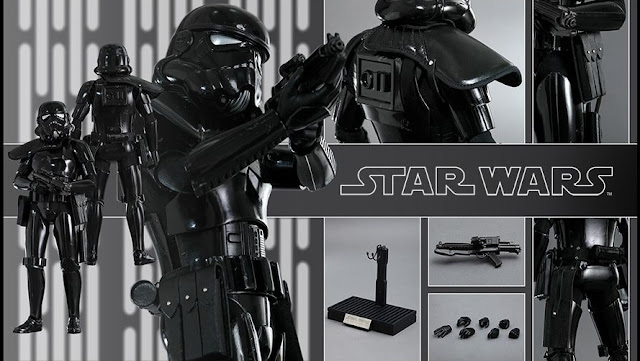 It also comes with the nice little Interrogator Droid accessory. 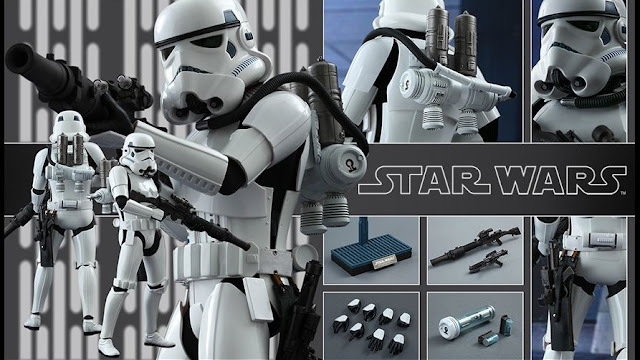 I think this time Hot Toys will include a light up feature on the lightsaber, which I actually prefer to do without! I don't like little electronic gimmicks that I rarely use and tend to break! But still, definitely looking forward to posing this with the Obi-wan figure! 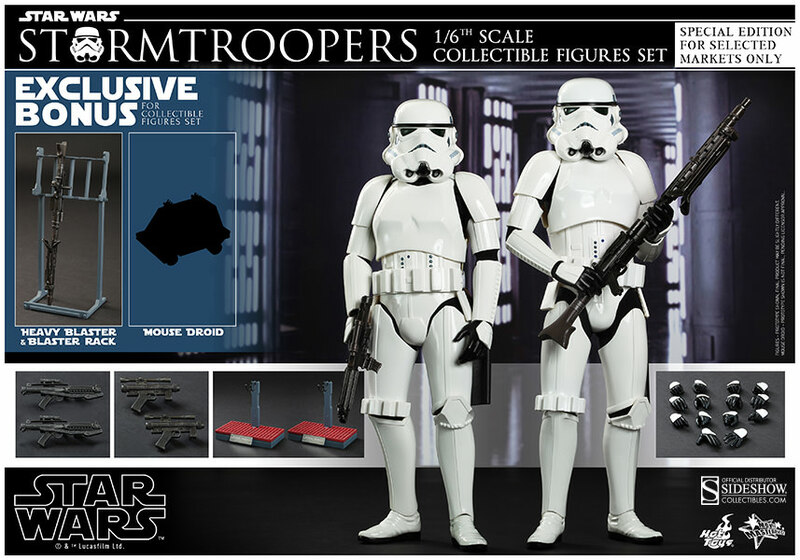 Before Obi-wan is released however, it looks like Hot Toys plans to release another trooper with their Spacetrooper. These troops were seen for only a few seconds in the scene where the Millenium Falcon is being brought into the Death Star. The external shot of the Falcon caught in the tractor beam is pretty iconic, but many miss the tiny little troopers in the foreground with their space gear. 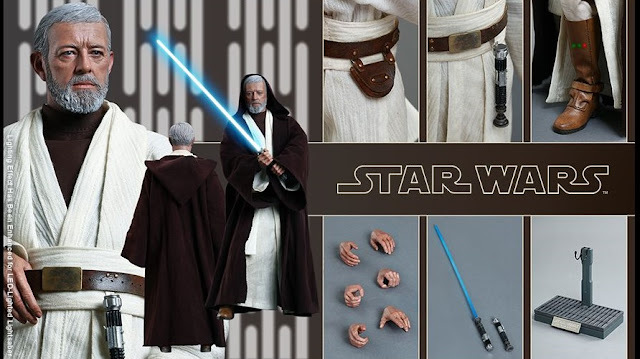 Up next is Old Obi-wan, which to me looks absolutely fantastic! 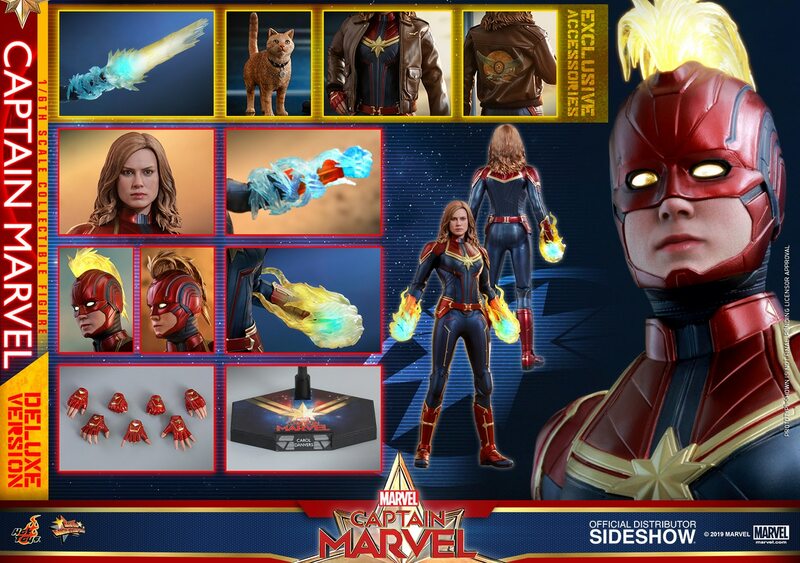 The head sculpt and detailing in the costume looks incredible, despite many collectors saying the sculpt is off. It looks like Alec Guiness to me, and the robe seems to fit and flow beautifully. Having this displayed in the cabinet with their Darth Vader will be perfect iconic awesomeness! Hot Toys has just officially announced the Sandtrooper as well for an early release in 2016. 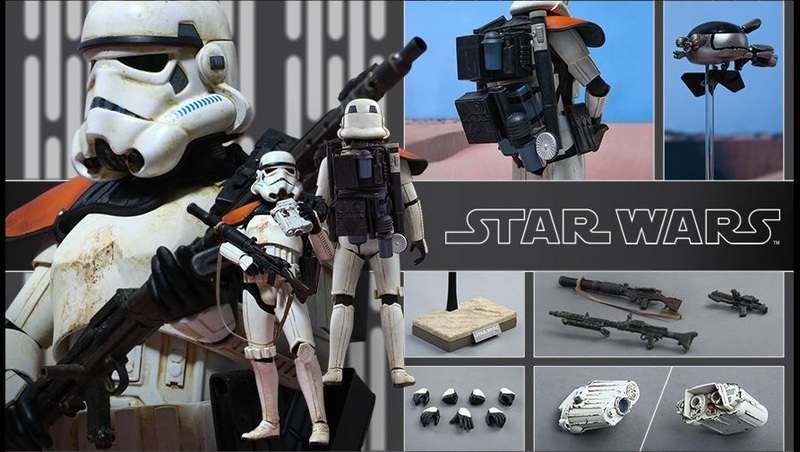 I still think the old Sideshow Deluxe Sandtrooper holds up extremely well to this, and in fact has more accessories I think. Either way, having both side by side will be a great comparison, and will look awesome displayed together. And finally, some teaser pics were posted recently from Japanese toy magazines showing the Death Star Leia and Tatooine Luke figures that we've all been waiting to see! The Leia figure even looks to have rooted hair for her buns, which hopefully they do well. I don't have too much experience with rooted hair so hopefully it doesn't need to much maintenance! 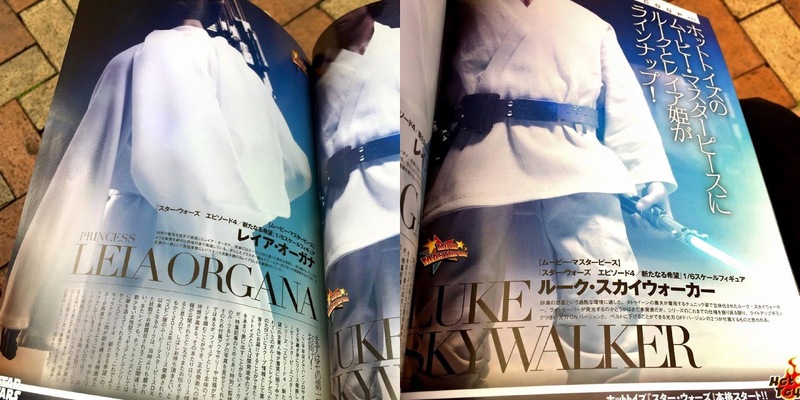 The Luke figure looks nice and simplistic, but it'll all come down to the head sculpt on that one too. The great folks over at new Chinese figure company Toys Power were nice enough to send me a couple of their figures to review. First up is the CT003 V for Vendetta figure, which overall is a pretty awesome figure for the price. Click below to head on over to my full video review on the Kool Kollectibles YouTube channel! The quality of the outfit and the materials used is definitely the standout feature of this figure. There are a couple of nits to pick, so definitely watch the review to hear about the pros and cons of this figure. It comes with a nice assortment of accessories, especially the real metal daggers that are very nicely detailed! The detailing in the outfit is awesome, and the rooted hair isn't too hard to handle once you get used to it.